Posted on 3/15/2018 by Amy ODonnell. 0 Comments. Are you thinking about improving and furthering your SAP skills, getting certified in SAP and advancing in your career? Have you wondered about what it would be like to learn SAP, but don’t know if it’s right for you? If so, why wouldn’t it be? Modern elearning isn’t about taking endless, repetitive classes that you may never use. If you’ve already earned a degree or two, you might be dreading the idea of “taking classes” again. But in 2018, learning a new skill isn’t like that at all. You don’t have to set foot in a classroom. 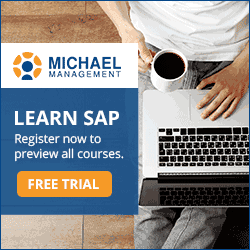 Learning SAP online with Michael Management can help you update your skills faster, easier, and at your own pace. 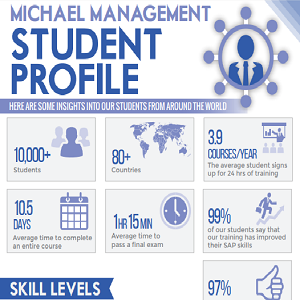 The average time our students need to complete one of our SAP certification courses is about 10 days. What will you do in those same ten days that will upgrade your skills and boost your SAP career? The truth is, our “typical” SAP learners come from all over the world and have as many different backgrounds as they have jobs. But they all have one thing in common: they want to improve their SAP skills and advance their careers. Signs up for an average of 24 hours of SAP training per year, or 3.9 courses yearly. Of all our 15,000+ students, 99% of them say that the SAP training they received from us has greatly improved their SAP skills. And 97% of them say they would recommend us to their colleagues. Students who train with us have job titles ranging from administrative assistant to IT manager to CIOs, and work for medium- to large-size companies large as well as government entities. SAP is the “universal language” they all work with and want to know better. That’s right, only about 1% of all 15,000+ students reach the Expert level and only a small number of students makes it to the coveted Guru level. We also discovered that 4 out of 10 SAP professionals felt like they didn’t have enough training to do their jobs properly. That’s a lot of people using SAP that really don’t know what they’re doing. Don’t Just Learn About SAP. Master It. We’ve taught SAP to over 15,000 students and helped them advance their SAP careers with new opportunities. Whether you’re a beginner or an advanced user, we offer training in the most basic SAP skills to the new specialization you’re interested in learning. With over 150 certification-level training courses, we offer more than 30 learning paths for common SAP jobs. Our exclusive cloud platform cuts your training time by 40%, with a 30% lower cost than traditional learning methods. Our hands-on training means you’re learning SAP in real time. Even if you already have some SAP experience, you can expand your skill set and your career, and become our next success story. Sign up for one of our individual SAP courses to get started, or sign up for a yearly subscription and take as many courses as you want for an entire year. Amy O'Donnell is a staff writer at Michael Management and curates various blog topics. An experienced writer with expertise ranging from writing web copy, blogs, and articles to white papers and case studies, Amy enjoys writing about food on her personal blog the most.